"This is the beginning, our fight has saved Ireland. The soldiers of tomorrow will finish the task." First off, I hope everyone had a happy Easter. Mine was pretty good although I'm annoyed and disappointed in myself for not making it to mass on Sunday. I'll have to do my best to make it up to the man upstairs for that poor showing. Easter of course also has significance to Irish people for historical and political reasons. It was ninety-two years ago that the Easter Rising got under way which saw many brave men and women standing up for the Irish nation by striking a blow at the British oppressor. People like myself owe our independence to the brave Irish people who took part in that event and who reawakened the Irish quest for freedom. Let us remember their courage and sacrifice as well as the many civilians of Dublin who were cruelly murdered by British soldiers during the fighting. Two years ago for the ninetieth anniversary celebrations I wrote in more detail about this period so if you didn't get a chance to read about that you might enjoy perusing some of the articles here. The 1916 Rising was a pivotal moment in Irish history but there is still much to be done by the people of Ireland to make the total aspirations of the 1916 leaders become a reality. Soon I feel our island will be reunited and when that day comes, we will know that the task has been finished in full. I'm pleased to see that the Mahon Tribunal is making great strides in uncovering Taoiseach Bertie Ahern's rotten financial web of deceit. The Taoiseach's former secretary, Grainne Carruth, broke down in the witness box as she admitted to lodging more than stg£15,000 into accounts held by Mr Ahern and his daughters, Georgina and Cecelia, in the 1990s. "Mr Ahern's lawyers said they would need more time to explain the apparent contradictions between Mr Ahern's earlier evidence and the tribunal's latest discoveries." The Taoiseach has repeatedly denied receiving a series of sterling payments, however tribunal discoveries have progressively isolated numbers of large conversions of the British currency. Our joke of a Prime Minister had previously insisted that all lodgements in the accounts were from his salary and in Irish currency. Whoopsie! Ms Carruth had previously denied ever making cash lodgements for Mr Ahern, or dealing in foreign currency for him. Yesterday, she stuck to her story, until agreeing that it was "virtually certain" the lodgements she made were linked to sterling. The payments were made into accounts held by Mr Ahern and each of his daughters, Georgina and Cecelia. The lodgement slips were partially filled out by Ms Carruth, and signed by her. Ms Carruth, a secretary to Mr Ahern for 12 years at his St Luke's constituency office, had previously asserted that it was only she who ever made lodgements to Mr Ahern's daughters' accounts. "She was unable to explain why those lodgements should be the proceeds of sterling conversions. "At one point yesterday, Judge Gerald Keys told Ms Carruth's solicitor, Hugh Millar BL, following an interruption: "Mr Millar, all we want is the truth. That is what we are looking for." "Presiding judge Alan Mahon told Ms Carruth that she should look at the building society documentation overnight and talk to her solicitor, "so that you will be quite clear in your mind as to your position in relation to your evidence". "Earlier, Blair Hughes, manager of the building society, said he recalled Ms Carruth making sterling conversions and subsequent lodgements at his branch. Deary me. It's all so sordid isn't it? 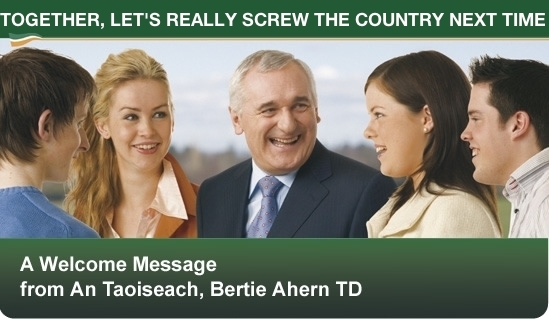 Let's be blunt about this - it's high time Ahern stepped down from his position. He is dragging the office of the Taoiseach through the mud. I didn't think it could get any worse after the Haughey years but I was mistaken. Let the Taoiseach sort out this unholy mess on his own time. It's an absolute disgrace that the people of this country have to put up with a Prime Minister that's up to his neck in corruption. 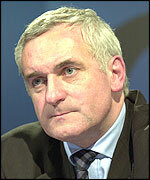 Labour's Finance spokesperson Joan Burton has said it's in the best interests of the country for Bertie Ahern to resign. Damn right. Can you imagine this kind of thing happening across the water in Britain? Can you imagine the British public putting up with this crap from Gordon Brown? Of course not. They know how to handle crooks over there. Honestly, de Valera must be turning in his grave. What has become of Fianna Fáil? Indeed. Mr Ahern, salvage some dignity for yourself and your once-great party and move on before you both drown in a sea of shame and sleaze. I said a couple of weeks ago that in the run up to this summer's referendum on the Lisbon Treaty (formerly known as the EU constitution) that I intended on drawing attention to this document which the EU and the Irish government wants to ram down our throats. I also said I hoped to interview campaigners on the issue so I'm pleased to bring back my Words on Wednesday feature here on United Irelander for an interview with author Kieran Allen, the man behind the booklet 'Reasons to VOTE NO to the Lisbon Treaty' and one of the editors of VoteNo.ie. You are the author of the booklet 'Reasons to VOTE NO to the Lisbon Treaty' and one of the editors of VoteNo.ie. What made you decide to take a stand against this treaty? I have attended many mobilisations of the European anti-globalisation movement and have become familiar with its demand for a ‘social Europe’. Europe has shifted from being a zone of stability within the global order to one where millions of workers are fighting to defend gains they won in the past. They are concerned about how Europe is being re-shaped by a small elite of corporate executives and puppet politicians. The call for a ‘social Europe’ arises from these mobilisations and is helping transform politics on the continent. The call for a ‘social Europe’ contains some ambiguities because it is not clear whether the aspiration of workers can be met by a return to the Keynesian economic policies of the past or whether it requires a fundamental change that ushers in a European socialist society. Nevertheless I identify with the aspiration and see the Lisbon Treaty as an embodiment of all that poses a danger to it. With a referendum expected in the coming months on the Treaty, what would a Yes vote mean for Ireland? It would a mean a strengthening of the Right and their politics of fear. Notice the absurd way they have been conducting the debate so far. Bertie Ahern – the former accountant who pretends to be the plain man of Drumcondra – leads the charge by framing his opponents as ‘lunatics’ and ‘extremists’. Fianna Fail and Fine Gael hacks develop the theme by claiming that a NO vote will frighten foreign investment into fleeing the country. (They somehow forget that foreign investment actually increased in France after they voted No to the EU constitution!) The rights always tries to reduce politics to a form of managerialism – who is better able to manage the economy- and to close down real discussions about the direction that either Ireland or Europe should take by stoking up irrational fears. They have been ably assisted by a pathetic Labour Party ( and an even more worse Green Party) who dare not challenge these absurdities but instead pretend that the Charter on Fundamental Rights will give Europe a ‘soul’ . They cannot, however, name one extra, specific legal right that the people of Ireland will get, which they do not currently enjoy. So a Yes vote will give a new confidence to neo-liberals who want to privatise everything and to the couch-potato soldiers who want the EU to engage in more colonial adventure like that in Chad. Like yourself I imagine, I've been very disappointed with the campaign of those seeking a Yes vote as it seems to me they are engaging in pure scaremongering tactics in order to achieve the result they require, warning about how a 'No' vote would damage our standing in the EU and so on. This is pure nonsense, isn't it? Of course it is. Do you really think that if you go on holidays to Paris, people will point at your Irish passport and fall apart in laughter because we voted No. Yet this is what EU Commissioner, Charle McCreevy, implied when he claimed that a No vote would make us the ‘laughing stock’ of Europe. Or that the morning after a NO vote, the executives of Intel or IBM will hold emergency meetings to organise the withdrawal of investment. One of the legacies of colonialism is that local elites insist that their population must show ‘gratitude’ to their betters at regular intervals. It is really sickening to hear Yes politicians start their speeches with the same lines – the EU has brought peace to the continent after WW2; it has given us billions in grants; and so we should not grateful and voting Yes. Don’t worry what is actually written in the Treaty, just sign a blank cheque out of gratitude. They are doing everything to avoid a discussion about what kind of Europe its peoples want – a neo-liberal Europe where more is spent on colonial adventures or a Europe that grants more social rights to its citizens. What are the chances of such scaremongering tactics working in your view? Is a Yes vote a foregone conclusion? There is a chance that scaremongering can work. After all, the corporate media is run by a handful of very rich people who are intimately connected to the political elite and so the same line is repeatedly trotted out. People used to complain that the USSR was a one party state but we live in a regime where there are different glove puppets but the one dominant message. You can choose among many brands of washing powder but you still end up with the same old stuff. You can choose between Fianna Fail or Fine Gael –or Labour or the Greens- but you will still get the same old EU consensus which presides over the current economic order. However, the politics of fear can also re-bound on our rulers. There is a lot of discontent in Ireland and I expect that the trade union march to demand a decent health service on March 29th will give some indication of its depth. If the NO campaign can relate its arguments to real concerns about privatisation and the EU’s role in the run down of public services, I think we can win. I was disgusted that our government ignored the wishes of the people by refusing to accept the original No vote to the Nice Treaty. If the people vote 'No' to the Lisbon Treaty, do you think we will be given another referendum in order for the EU to get their way? You have to be careful about this argument. I have heard many NO people say ‘what is the point of voting when they will only ask you again to re-ballot in order to get the right answer’. But there is always a point to resistance. The more our rulers take off their masks and are forced to engage in undemocratic tactics, the more their legitimacy is corroded in the eyes of the population. It will also be far harder this time for them to make us re-ballot. There is a huge, latent anger throughout Europe about the fact that the other 450 million people have been denied a right to vote. If the EU leaders refuse to recognise the vote of the only country where there was a ballot, there will be a continent wide outcry. The EU elite will, I think, calculate that the danger of pushing the Irish to vote again will outweigh the advantages they might gain from the Treaty. You've been speaking out against this treaty along with several other campaigners. What has the general response been like from the public? Good. A debate I did in Castlebar against Jim Higgins, MEP went really well because most people left the meeting supporting the NO position. At one point, Jim Higgins even called on people to vote yes ‘for God and for their country.’ I attended another meeting in Liberty Hall where the Fine Gael MEP Gay Mitchell was debating Sinn Fein’s Mary Lou McDonald. The feeling for the No side was so strong, that Mitchell claimed that the meeting was ‘packed’. In fact, there were only two members of the Socialist Workers Party present and a handful of Sinn Fein people in the 150 strong crowd. It revealed the depth of his paranoia – and but more importantly showed that the No side wins when people get a chance to hear a real discussion about what treaty contains. Would it be fair to say that this treaty, if passed, makes a mockery of Irish history since we spent so long trying to get out of a Union that wouldn't listen to us, only to now have Irish parties trying to sweep us into another Union which again won't listen to us? Not sure about that. I am a strong anti-imperialist and have no time for revisionist historians who attack Ireland’s history of resistance to empire. But I do not see this primarily as a nationalist issue. I am an internationalist, a citizen of Europe and the world and want a political debate that transcends national borders. So I think the focus must be on what kind of Europe do we want. I don’t think that Pearse or Connolly focused their argument on what kind of Britain empire they wanted. And quite right too. There used to be discussion on the Left many years ago that Ireland had moved from being a colony of Britain to a neo-colony of either the US or Europe. I never believed it. Ireland has produced it own little capitalist class who proudly taken their place in the global networks of that class. We equally have to move beyond a nationalist horizon and join with others in movements across Europe that are resisting the same capitalist elite. What would you say to anyone reading this right now who is unsure of where they stand on the Lisbon Treaty? Don’t be browbeaten. Get hold of the Lisbon Treaty. Ring up the EU Office in Dublin and demand that they send you out a copy. You will be given a series of amendments which will make little sense unless you see the original treaties. So also ask for them for these as well and demand that they are made freely available to you because you need to see what you are voting on. If they do not facilitate you, then vote No. You would not buy a house or a car without the seeing the contract – so why would you decide on the future of a continent without knowing what this constitution contains. If you do succeed in getting the documentation, sit down and study it. Consult our website Voteno.ie and check out the Yes side as well. If there are any points you want cleared up, do not hesitate to contact us. Better still, you might consider getting a few friends of colleagues together for a discussion. Voteno.ie will be delighted to provide you with a speaker. In other words, act as a good citizen and remember you are voting for the whole people of Europe. The neo-liberals who think ‘there is no such thing as society’ will be very upset – but who cares. The key is to organise. We are up against a massive, well funded propaganda machine. We can only win if we get NO campaigns organised in very town in Ireland and there is no mystery about how that can be done. You need to, firstly, hold briefing meetings for activists or would-be-activists. You can do this by booking a room in a pub or a community hall and advertising it in local media or with notices in local shops. Voteno.ie will send you a speaker who will take you through a hour and a half long power point presentation. Just e mail us on info@voteno.ie. Once you feel equipped to make an argument to your fellow citizens, you need to get leaflets and posters for distribution. Energy and enthusiasm can beat the money merchants. But it needs a little organisation to get focus. So to paraphrase: educate and organise so that you might be free. Thank you for your time Mr. Allen and I wish your campaign all the very best. Best wishes to everyone on this St. Patrick's Day. I'm pleased to see that the weather is sunny here where I am in Dublin. I used to have this notion as a kid that if it was sunny on St. Patrick's Day then it meant a good summer ahead. Not sure how accurate that theory was since most summers I recall were miserable! Hopefully the theory comes good this year though. Hope you enjoy the day wherever you are. I'm going to do my liver a favour this year by going easy on the drink but if you're feeling merry tonight I wish you well! Yes while most men, women and children would be lucky to get a day off work or school to celebrate our national holiday, our public representatives don't have to return to work until April 2nd. Well they work so hard throughout the year that they deserve a longer break, right? In fact they deserve lavish, expensive paid vacations and you the Irish taxpayer, yes YOU, will be delighted to learn that your taxes accomplish precisely that for the poor buggers. Huzzah! Anthony over at the Public Enquiry site detailed how Irish politicians are not required to produce receipts for their expenses. Checks are NOT made and the whole system is operated on the basis that they are honest and won't cheat you, yes YOU, the taxpayer. Sounds good to me! Irish politicians being dishonest? Like that could ever happen. "A caller to Liveline today tells us how Irish taxpayers paid €1,650 per night to Seamus Brennan (Minister for Arts, Sport & Tourism) to stay at an apartment in Rome last year. "The caller was puzzled as to why Brennan couldn’t have stayed at the luxurious five stars Westin Excelsior hotel in the centre of Rome for a mere €355 per night. This hotel regularly caters for statesmen from all over the world. Stayed there myself for a week once and was very impressed. "The caller told us that taxpayers paid Junior Minister Mary Wallace €1,000 for VIP services at Dublin airport on a trip to Vienna. Just to repeat that – She collected €1,000 for VIP services at Dublin airport!!!" Damn straight. Nothing but the finest for our politicians. How lucky we are - and you, yes YOU the taxpayer, to live in a true republican society where all of our citizens are treated as equals. Raise a pint to that on St Patrick's Day and marvel at the majestic, near-utopian country we live in today thanks to the great men and women of Fianna Fáil. Photo courtesy of Hubritic Anomaly. 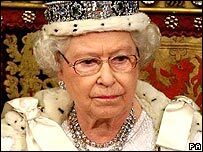 I see British Prime Minister Gordon Brown's latest hair-brained scheme is to encourage children in the UK to swear an oath of allegiance to their queen and country. I must say I think it is both a dangerous and highly stupid suggestion. Report author, ex-attorney general Lord Goldsmith, says it would give teenagers a sense of belonging and would help improve their sense of what it means to be a British citizen. "It's offensive to people who do actually cherish democracy and who actually cherish the sorts of liberties we've fought for centuries." If children refuse to take part, he added, "are they then going to be told or taught that they are somehow less British or less loyal or less patriotic?" Good question. Obviously this idea is designed to work similar to the oath of allegiance that they have in America, but the major difference is that Americans aren't pledging allegiance to an INDIVIDUAL but rather to their COUNTRY. Personally I don't think oaths of allegiance are necessary whatsoever. I don't need anyone telling me to show allegiance towards my nation. children to do this. In this modern world there is no need for a monarchy. She/they parasites and hangers on do nothing. She & her inbred family are only there to draw tourists to the UK. I look forward to the day when Scotland is an independent Republic. England can keep her." "Swearing allegiance to the head of a morally bankrupt family of foreign parasites, suggested by a man from a privileged position in an institution that should have been closed down long, long ago! Is it April the first?" "Swearing allegiance to Queen and/or Country? What's next, letting blood under british oaks in the shine of burning torches? To me this sounds like hopelessly outdated nationalism. Worryingly reminiscent of Germany around 1933, anybody refusing the oath to the austrian painter was sidelined first, and shot few years later.To prevent alienation of the UK youth make sure that they are properly supported, and socially integrated. Distribute wealth rather than praising the fortune of the rich!" "What is the point of this? You either feel British or you do not & making an oath to Britain smacks of the old empire days of long ago & will serve no purpose whatsoever. You are going to alienate people, not everyone feels British, personally speaking to me Britain is the Island & not the countries. You also have to deal with all the arguments of people who feel Irish, Scottish, Welsh, English & not British what will the point of them swearing to something they don't believe in?" "I would rather cut of my testicles and dip my bleeding scrotum in a bucket of lemon juice, that swear allegiance to that fat, useless, clapped out old leech in Buckingham palace. This has to be the stupidest most pointless idea Gordon Brown has ever had. Jesus wept." I definitely think this idea is a non-starter. The monarchy is an archaic institution. A remnant of a bygone age. The idea that people are superior to certain others due to their background is a philosophy best left in the dark ages. We might as well bring back the Pharaohs. So DUP leader Ian Paisley is to 'step down' from his role as First Minister and leader of his party in May. I think it's more a case that Paisley has been shafted by his power-mad minions due to the furore last month over his son Ian Jnr (who resigned as a junior minister in the NI Executive following criticism over his links to developer Seymour Sweeney). Paisley had previously indicated he wanted to stay on for a few more years but those plans have been shelved. Coincidence? I think not. Especially when many in the DUP are said to be concerned at attitudes within the unionist community, many of whom are upset at Paisley's recent pally relationship with the Deputy First Minister Martin McGuinness. I'm not bothered much about Paisley's departure to be honest. What bothers me is the historical revisionism that has been floating around. The idea that he has been a noble crusader for justice, a defiant champion of communities etc. To me and many Irish nationalists he will be remembered as the man who started a riot in 1964 after he demanded police remove an Irish tricolour from a Sinn Féin office in Belfast, the man who opposed the efforts of NI Prime Minister Terence O'Neill and Taoiseach Sean Lemass to establish a cordial relationship between both sides of the island, the man who was involved in counter-demonstrations against civil rights marchers, the man who accused Pope John Paul II of being the 'Antichrist' during his speech to the European Parliament, the man who helped bring down the Sunningdale Agreement and who opposed the Anglo-Irish agreement and the Good Friday Agreement. Disgraceful activities one and all. While I acknowledge that he has made a positive contribution towards politics in this island in the past 18 months or so - a contribution I have given him credit for - that doesn't mean we can forget the many blemishes on his character. The reality is he showed a confrontational and aggressive attitude towards nationalists and the people of the south of Ireland for much of his life, and helped to delay the reunification of this island. For that, I don't believe history will look upon him too kindly. "Unionists are no longer protesting against a London/Dublin deal with which we have no truck. "We are inside the building administering British rule over Northern Ireland." It is nice spin but little more. In truth he is administering nationalist/unionist rule, has signed up to the concept of North/South cooperation and has accepted Dublin's undisputed right to have a say in the North's affairs - had he not done so we could well have Joint Authority in operation right now. The agreement he reached with SF was not much different to agreements he bitterly protested against that involved the likes of Brian Faulkner, Margaret Thatcher and David Trimble. The key difference was he was the figure at centre stage. I regard Paisley as complex personality, with a considerable ego and a very stubborn mindset. I will congratulate him nonetheless on ensuring that his life's legacy will not be simply that of an intransigent bigot whose political vocabulary revolved around the word 'No'. I wish him well in his retirement and I hope that in his twilight years he lives a long and happy life. Long enough I hope to see the island of Ireland reunified at long last the way it ought to be.